Berg’n: Since opening in 2015, the Brooklyn-based food hall in Crown Heights has quickly emerged as a local hotspot for its trendy food offerings. Visitors and locals can sample tasty burritos at El Meat Hook, Filipino-inspired cuisine at Lumpia Shack and pulled pork and brisket at Mighty Quinn’s Barbeque. Led by the founders of Brooklyn Flea and Smorgasburg, Berg’n is open for breakfast, lunch and dinner. Visit bergn.comfor more information. Eataly: The popular Italian marketplace, home to restaurants, food and beverage counters, a bakery, retail items and cooking classes is expected to open a 40,000-square-foot outpost at 4 World Trade Center later this year. Visiteataly.com for additional information. The Great Northern Food Hall: In early summer 2016, internationally acclaimed chef Claus Meyer will open a Nordic-inspired food hall inside Grand Central Terminal’s Vanderbilt Hall. The 5,000-square-foot space’s offerings will include baked goods, granola and Danish open-faced rye sandwiches called smørrebrød. For updates, visitgrandcentralterminal.com. Hudson Eats: The upscale dining terrace located in Lower Manhattan’s Brookfield Place features many of New York City’s top casual eateries, including Black Seed Bagel, Blue Ribbon Sushi Bar, Chop’t, Dig Inn, Mighty Quinn’s Barbeque, Num Pang, Skinny Pizza, Sprinkles and Umami Burger. 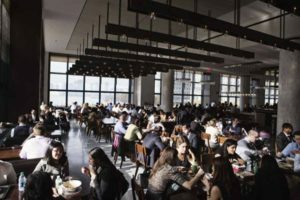 The 30,000-square-foot space provides seating for up to 600 guests and offers views of the Hudson River and Statue of Liberty. Additional information can be found atbrookfieldplaceny.com. Queens Night Market: The large, family-friendly open-air night market in Queens features independent vendors selling merchandise, art and food that celebrate the rich cultural diversity of the borough. The market is located outside the New York Hall of Science in Flushing Meadows Corona Park, and currently runs every Saturday through August 20th. The market is open from 6:00 pm through Midnight. For a complete list of upcoming vendors visitqueensnightmarket.com.